Blue Pipe Valve: I am guessing this belongs to Pacific Gas & Electric Co. Taken in Hayward, California, a suburb of the San Francisco Bay Area. Snapped on: March 11, 2005. 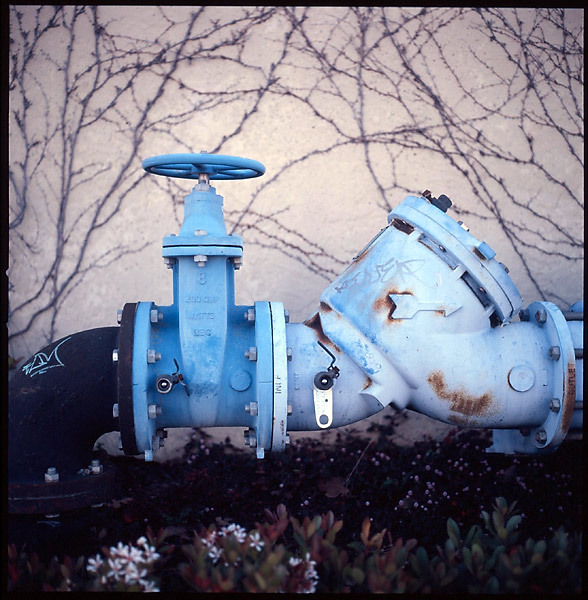 Hasselblad 500C/M, Planar 80 C T* ISO100, Fuji RAP 100F (Astia) film, Developed by Gasser's in SF. Circular polarizer used: Tiffen 52mm polarizer (for my Nikon lenses) with B50 to 52mm filter adapter.